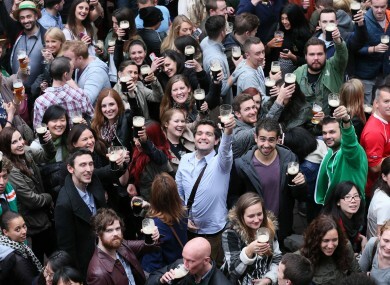 HUNDREDS OF THOUSANDS of people painted the town black and white last night as Arthur’s Day took hold of the country. The celebration, organised by Diageo, has come up against a storm of criticism over the last week, with charities for alcohol-related issues saying that ‘alcohol, and not music. takes centre stage’. Speaking on RTÉ’s Morning Ireland today, Diageo’s CEO Peter O’Brien said that last night was a success with “fantastic engagement with Guinness, the pub and music”. “It’s been a very difficult week, I’ll be the first to admit that but I’m hugely encouraged by what we’ve heard,” he said. O’Brien said the Garda Chief Superintendent in Pearse St had informed him this morning that incidents were “down 50 per cent” this year. A garda spokesperson also told TheJournal.ie that there were no major incidents reported last night and that there were “no more arrests than usual”. Also speaking to Morning Ireland, Gerry McCarthy, consultant in emergency medicine at Cork University Hospital said his emergency department recorded just 14 attendances related to Arthur’s Day out of a total of 180. However he added that St James’ Hospital in Dublin “reported a significant increase in admissions that appeared to be related to alcohol”. Email “Arthur's Day incidents 'down 50 per cent' in Dublin's city centre”. Feedback on “Arthur's Day incidents 'down 50 per cent' in Dublin's city centre”.